There has been considerable discussion on the history of the collections gathered by the Botanical Expedition to the Viceroyalty of Peru, members of which remained thirty-four years (1777–1811) collecting in the New World. Two species names in Rauvolfia (Apocynaceae), Rauvolfia flexuosa, the basionym of Citharexylum flexuosum since Don’s combination in 1831, and Rauvolfia macrophylla, now treated as a synonym of the former species name, were published by Ruiz and Pavón based on plant material they collected in Peru as well as material herborized by Tafalla, a subordinate who remained exploring in South America after the return of Ruiz and Pavón to Spain. 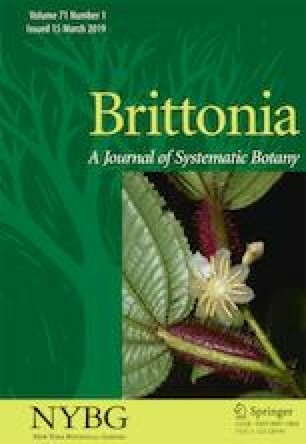 A third species name, Citharexylum dentatum, was published by Don also based on Peruvian material collected by Tafalla. The resale and/or redistribution to other herbaria of a large part of the material gathered by the expedition members in South America has caused much confusion and hindered proper typification of these names. Based on thorough study of original material, original manuscripts, and pertinent literature, a critical review is provided and lectotypes are designated for the names R. flexuosa, R. macrophylla, and C. dentatum. We are indebted to Chiara Nepi (FI), Laurent Gautier (G), Ranee Prakash (BM), Christine Niezgoda (F) and Vladimir Dorofeyev (LE) for their help in locating material at their herbaria. Special thanks are given to curators of herbaria BC, CGE, and US who helped with the search of specimens. We are most grateful to Esther García Guillén and Irene Fernández de Tejada de Garay for their insight on the manuscripts held at the Real Jardín Botánico (MA). The first would like to thank to Agustín Elías Costa (MACN) for his constructive criticisms. We are also grateful to Robbin Moran and Benjamin Torke for their significant editorial work, and two anonymous reviewers for their constructive comments, which helped us to improve the manuscript. Financial support from the Consejo Nacional de Investigaciones Científicas y Técnicas (CONICET PIP 00537/13) is gratefully acknowledged.